The latest UNKILLED APK is now available and the current version is 0.1.0. This game is a first person shooter game where you will fight shooting at zombies amid the ruins of the city of New York. You will play as a former Marine named Joe, Wolfpack team members assigned to counteract the wave of the invasion of zombies before widespread throughout the country. Although most of the game is very similar to Dead Trigger, but Unkilled has a lot of variations of zombies that form you may have never imagined. Costumed zombie shirt lethal radioactive, decapitating zombies with a giant knife in hand, fat zombies with explosive mines in the abdomen, and others you can find here. In addition to a variety of zombies whose shape is varied earlier, Madfinger Games also emphasized the element of teamwork in Unkilled. Players will assisted AI computer to complete various missions provided. Although it sounds like is not something new, this feature is an enhancement of the mechanisms Dead Trigger 2, where we are given a partner that we must keep up to the pickup spot. More than fifty–count ‘em!–weapons, including LSAT, SAIGA-12K shotgun, and M24 sniper rifle! The rewards for completing storyline missions have been improved. The tutorial has been completely revamped and improved. 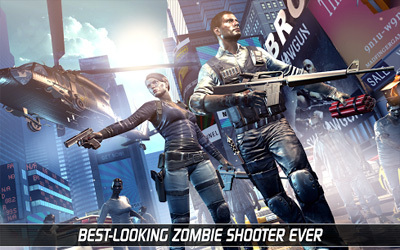 One or probably the best zombie shooting game in android. Better than dead trigger/s though they’re also the team (madfinger) behind this game. Energy level is not a problem for me.